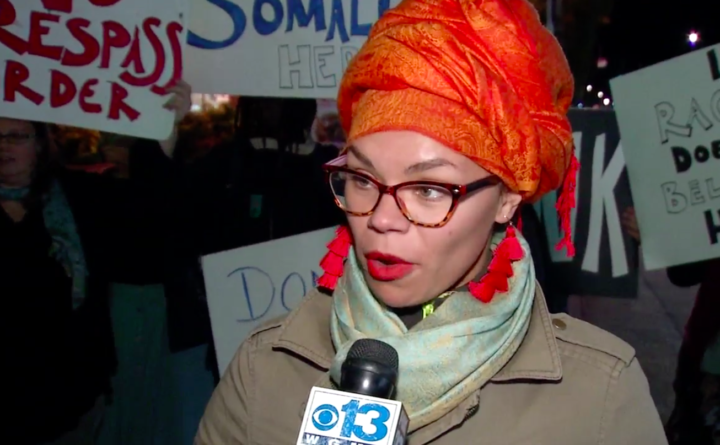 A protester who goes by the name Viva told CBS 13 that the St. John Street Dunkin' Donuts called police on Hamdia Ahmed for speaking Somali while at the drive-through window. A local Dunkin’ Donuts is under fire as the target of protests after it was accused of refusing to serve a Somali woman. The confrontation started with a heated exchange at the doughnut shop’s drive-thru. The protest Tuesday night stems from an incident Monday at a Portland Dunkin’ Donuts. A small group of protesters said the issue is bigger than this single alleged incident, but the focus is on what Hamdia Ahmed said happened to her at the Dunkin’ Donuts on St. John Street on Monday. She posted part of the exchange at the drive-thru window on her Facebook page. Ahmed said she was speaking in her native language, with her children in the back of the car, when things became heated. “One of our young women was with her family yesterday just trying to make an order in the drive-thru, and they were speaking Somali, and one of the managers in the store said to stop yelling at them and to leave, that they wouldn’t serve them and that they were calling the police,” Ahmed’s friend Viva said. Viva said Ahmed then went into the store to ask what was going on. That’s when police arrived and served her a no-trespassing order. “They did call the police, the police showed up and served them a no-trespassing order for speaking Somali, which that’s not the Maine that I accept,” Viva said. Portland police did not respond to requests for comment Tuesday night. Viva said she believes her friend was misunderstood. “The nearest it seemed that she understood was that the tone was different because the tone in every language is different, and that the person on the other end of the drive-thru microphone misinterpreted the tone as something aggressive or dangerous, which seems to me to be just xenophobia,” Viva said. In a statement, the owner of this Dunkin franchise said he is interviewing employees and looking at surveillance video of the incident to find out exactly what happened. Meanwhile, no charges are expected, but protesters said it’s already gone too far.